A term used in any kind of multi-player game (including Video Games, Collectible Card Game, and Tabletop Games) to describe the process in which newly-added-content can be played along with the old-content, but with the new content being far more powerful/useful in every sense. This process leaves old-content completely worthless, save for a few exceptions and for Cherry Tapping. This makes sense, at least from a monetary point of view. New-added-content requires people to actually buy it and use it, but why would they use their money to buy some obscure thing they don't know how to use (yet) if they can keep on using their awesome Infinity +1 Sword by paying 5 mana? Easy, make every new content item an Infinity+2 Sword which requires 3 mana to work. And the same will happen in the next expansion, with an Infinity+3 Sword that only costs 2 mana. As a general rule, though, Power Creep has a negative connotation. The reason behind it is that, while there may be some few exceptions, it usually shows that the producers were unable to come up with something creative, and instead resorted to repeating themselves, just with bigger numbers. Power Creep also tends to lead a game beyond its pre-defined limits, with one of two results: it will becomes a competition of mindless speed, or of predictable slow strategies. The one time Power Creep can be positive is when it is used on something that was already a Joke Character to begin with. The two Hearthstone: Heroes of Warcraft cards in the page image are actually an example of this. 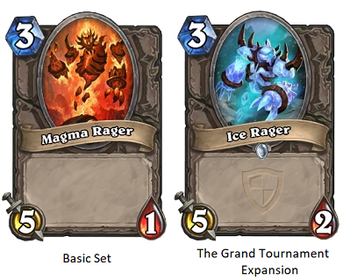 The Ice Rager is "strictly better" (as Magic players put it) to the Magma Rager, having two Hit Points instead of one and being identical in all other respects (3 Mana to cast, 5 attack); if you have access to both, there is never a reason to play Magma Rager instead of Ice Rager. Having said that, there was also never a reason to play the Magma Rager in the first place. (The explanation for that is technical enough that we're going to hide it under this note In Hearthstone, you have a mana Cap that starts at 1 on your first turn, and goes up by 1 every turn thereafter until maxing out at 10. This rule can be broken, but only with difficulty. So, for most players, a card that costs 3 Mana, like Magma Rager, can only be played on turn 3. The problem is that it's also a One-Hit-Point Wonder... and cards with 1 Attack, capable of killing it, are castable on Turn 1. If you spend 3 Mana putting a threat on the table and your opponent destroys it at the cost of 1 Mana, then, all other things being equal, your opponent came out ahead. So, in practice, the Magma Rager is a waste of 2 mana, and the Ice Rager not much better.) Additionally, releasing a (more) playable version of it lampshades the fact that the game's designers released something unplayable in the first place. This trope is the Gameplay Mechanics counterpart to So Last Season, Overshadowed by Awesome, Sequel Escalation and Serial Escalation, which refers to narrative or thematic elements. Compare with Revenue-Enhancing Devices. So Last Season applies to non-gaming examples of this trope. The complete opposite of Promotional Powerless Piece of Garbage, which is a new content which is actually unusable. This concept is discussed along with ways to circumvent it by Extra Credits here and again here , here , and here . Not to be confused with Power Creep, Power Seep. Nerf Brand guns come in Gatling models now. The old ones obviously do not hold up. Figurines from Monster in My Pocket originally had a value between five and twenty five, but by the time the fourth set was out these had ballooned into the triple digits. Perfect monsters were what everyone wanted in the original Digimon V-pets. The pendulums added Ultimate monsters, which were better than the supposedly "perfect" ones. Later editions added Super Ultimate monsters, which were superior to the supposedly "ultimate" ones. The MicroStars series - a set of collectable Football player figurines that could be used in a tabletop football game, suffered badly from this. When the first series of players were released, Gold-base players (the strongest and rarest) would have their five stats total around 50-60 with no stat being higher than maybe 15. By the time the figures stopped being sold in shops, Gold-base players could have stats of 25 across the board...and then there were the new Black-base players who were even stronger (and rarer). BattleTech is a prime example due to the setting's moving timeline. The series originally started with a baseline of weaponry and equipment utilized by the Inner Sphere during 3025. As the years advance, lighter and more effective technology from the fallen Star League is gradually (re-)introduced, tremendously shifting the Metagame in favor of them. There was a stretch of years when almost every new BattleMech featured at least one of the following: CASE, Double Heat Sinks, ER PPC's, Extralight Engines, and Gauss Rifles. Everything is completely turned on it's side after an invasion by the Clans, who possess a slew of super advance technology and battlefield tactics never seen before. The Jihad introduces even more changes to the status quo: superheavy 'Mechs, DropShips that can destroy WarShips, cybernetic MechWarriors, and various Doomsday Device weaponry (up to and including a planet killer mass driver). The ongoing Dark Ages is sure to bring more changes. In terms of overall design, it both played this straight and inverted it, in that the playerbase generally regards its initial material as containing the strongest classes and the weakest classes in the game. This was because the designers really hadn't figured out how to balance the new system yet, and conversely ended up with some classes being hilariously broken because they could abuse its mechanics, and others being utterly underpowered because the designers overestimated how good their abilities were. As a result, most classes to follow by the midpoint of the game tended towards the middle - for instance, the warmage and warlock are a lot weaker than the wizard but fill a similar role, while the duskblade and psychic warrior are a lot stronger than the fighter. A party of a binder, a dread necromancer, and a warblade would follow about the same party roles as the classic cleric-wizard-fighter trio, but be a lot closer in power. It's played completely straight with spells and feats, though, as a lot of sourcebooks would release new ones that broke one or more limitations. Compare Polar Ray (Evocation, 8th-level, single target, does 1d6 cold damage per level, offers Spell Resistance) to Orb of Frost (Conjuration, 4th-level, single target, does 1d6 cold damage per level and target must save or be blinded for a turn, doesn't offer Spell Resistance). This is a major reason for why casters are seen as broken, since it's easier for them to grab all the nasty tricks they can do in sourcebooks. Early on in the game, many casting-based prestige classes had a stunted progression, either not advancing spells or only advancing them every other level. Since very few things to a caster are worth losing their spells, most of the later ones provided either full advancement and incidental features, or full advancement barring one or two levels in exchange for really good features. An odd microcosm of the gradual "this isn't actually broken" realization can be seen with Breath Weapons. Initially, it was restricted for player use to either half-dragons or the dragon disciple Prestige Class, maxed out at 6d8 damage, and could only be used once per day. Later on, there was the dragon shaman, which obtained a Breath Weapon at 4th level that did a maximum of 10d6 damage, but had a recharge time of 1d4 rounds. By the end of the game's lifespan, there was the dragonfire adept, whose standard attack is a Breath Weapon that does a maximum of 9d6 damage, comes online at 1st level, and can be used every turn, and most of their abilities focus on ramping it up even further. Coincidentally, it's considered the only one of the above to be worth the effort. Another infamous one is the hexblade and duskblade - one which came out early on, the other a few years afterward. Both were designed to fill the Magic Knight role, but the designers were apparently very tentative about a character who could do magic and fight in melee - the result being the hexblade, a class that kinda sucked at both. When one compares the two classes, the duskblade comes out ahead in almost every way - better armor and saves, spells are gained earlier, stay at full caster level, and can be used more often, spell list includes 5th-level spells while the hexblade is stuck with 4th, and instead of the unimpressive Hexblade's Curse, they have the highly-damaging Arcane Channeling. Pathfinder suffers from this trope in at least two ways: one specific and the other generalized. The latter is thanks to Linear Warriors, Quadratic Wizards. Newer material for melee classes does not match the Game-Breaker combinations spell casting classes are capable of, which is often summed up by jaded pro-melee members of the community as, "fighters can't have nice things." The argument is that each new book leaves melee classes farther behind the already impressive spellcaster power curve. This is especially noticeable with certain official Paizo adventures, as the "final boss" to a high level campaign is either a full caster or has inherent abilities that negate spells to keep up with the Metagame. A more direct example is the Pathfinder Unchained rule book, that offers revisions to making melee classes vastly more powerful than their vanilla original versions (via the new addition of Combat Feats), to help mitigate the perceived Linear Warriors, Quadratic Wizards problem. This is usually a problem with any codex that hasn't seen an update in a long time. The Dark Eldar and Necron codexes were infamous for this for a long time, as they were the oldest codexes not to be updated (the Dark Eldar had, at one point, gone 10 years without an update. That's almost 3 whole editions) and the Bretonnia book suffered from this as well (Their old perk was being able to field a full-cavalry army with a special regiment formation, but they changed to a unique regiment formation that, due to the new rules, doesn't actually do much for them and can actually be a handicap). A curious case of this happened with the Dark Angels and Black Templar 4th edition codexes. The Dark Angels, at the time, was part of a new wave of Space Marines; the cost of transports were reduced and they were given the Combat Squad rules as well as Characters who could change the force organization. This later all became moot when the standard Space Marine Codex got most of these (except for the all-Terminator army) and became completely moot when the Space Wolves gained Logan Grimnar (who could make all-Terminator armies). Black Templars, meanwhile, became the only Space Marine Codex to not have access to any of these perks during the duration of 5th edition. When 6th Edition hit, their codex instead got dropped and merged into the standard Space Marine codex. The scope of the game also has drastically changed. In 2nd Edition, an Eldar Guardian is suppose to be considered heavily armored and Fast, as they possessed a 5+ armor while still being able to run. In 3rd edition, the swarm-unit Termagants cost 8 points and needed upgrades, but was still classed as a swarm creature. In the current meta, a model costing 8-10 points had to have either a fantastic gun, decent armor, high toughness, or some combination thereof. The Termagant, meanwhile, was reduced to half the points without reduction in any of its combat abilities, but despite that it's now considered one of the least competitive units unless paired with it's support unit the Tervigon. Similarly, Eldar Guardians are considered to have paper-thin armor, and their running ability has become near-universal (Eldar just run faster). The advent of D-Weapons, Superheavy vehicles and Gargantuan Creatures. All of these introduced new rules on top of existing rules, because they were suppose to be so powerful that the current statistic system couldn't accurately represent them without exceptions. D-Weapons in particular, as they were supposed to be literally Up to Eleven as the Strength value only goes up to 10. In 7th edition, they were all incorporated into the base rulebook, whereas previously they were exclusive to the Apocalypse supplement. Happens so frequently that the term "strictly better " has entered the Magic lexicon to describe the phenomenon. Card A is "strictly better" than Card B when they are identical in most parameters, and in the ones where they're different Card A has a clear advantage, meaning that Card A is preferable to Card B in almost all situations. Specific example: Lightning Bolt costs 1 mana and deals 3 damage where Shock does only 2. (Note that this comparison is not an example of Power Creep- quite the opposite, in fact, as Lightning Bolt was identified as being flat-out overpowered and Shock was introduced after it to be a more-balanced replacement.) Such cards often exist in newer sets for limited formats (where players open packs of cards and build decks out of just those cards) for the sake of balancing restricted card pools. An incomplete list of cards that fit the "strictly better" comparison can be viewed here . In total fairness, the game is over 20 years and 20,000+ cards old, which simply suggests that Power Creep is inevitable on some level, not to mention the fact that the most powerful cards in the game came with it's very first set. There is also deliberate creep on the part of Wizards. The overall pattern has been creatures growing in strength while spells get weaker. When the game first came out, Linear Warriors, Quadratic Wizards was in full effect. The infamous Power Nine were early cards considered to be the most powerful effects in the game (despite all but one of them being fairly boring in effect). Six of them are mana sources while the other three are all spells, with no creatures appearing. Meanwhile, Force Of Nature was originally the biggest creature in the game, an 8/8 (for 6 mana) that you need to keep paying mana to in order to keep alive. Nowadays, Terra Stomper - a "strictly better" version with a more flexible casting cost, the upkeep drawback removed, and a small perk added - is too weak to play in competition. Additionally, compare Serra Angel , a creature that was at one point removed from the core set for being too powerful, to Baneslayer Angel , which lacks one of Serra Angel's traits (Vigilance) but replaces it with a metric crap-ton of other stuff. The generally-agreed-upon theory as to why creatures suddenly became extremely useful around 2003-2004 was that, for the first 10 years of the game's life, creatures were largely a total waste of mana. While a few were actually considered "good", such as Morphling and Psychatog, the vast, vast majority were considered plainly useless compared to Enchantments, Instants, Sorceries, and even Lands... to the point that most top-tier Type 1 and Type 1.5 decks (now called Vintage and Legacy Formats) were creatureless. Wizards vastly overestimated the effect that creatures had on the game outside of Limited and Standard, and around 8th Edition, realized that they needed to make creatures relevant. What ensued was massive power creep of creatures that were intensely mana-efficient, so that they would be considered just as useful as other card types. It worked: it is now very rare for Modern, Legacy, and Vintage decks to contain no creatures, but at the same time they aren't the bulk of most decks, either, with most decks playing between 8 and 18 creatures (out of 60 total cards, about 1/3 of which end up being lands). Wizards has also identified complexity creep as an issue. The rules needed to deal with thousands of different cards make for an imposing document. The spiraling increases in complexity put the game at risk of being impossible for any potential customer to understand. To combat this, they createdthe Type 2 (or Standard) format, which is theoretically immune to both power creep and complexity creep as only the last two years of cards are allowed, so that power creep/seep relative to older cards doesn't matter. Wizards also takes measures to avoid the level of power creep that other CCGs suffer by temporarily increasing the power of one type of effect, but scaling it back later to focus on another aspect. Finally, it should be pointed out that "strictly better" cards almost always have another downside: they're (almost always) strictly more expensive, especially in cases like Lightning Bolt vs Shock where the more powerful card was deliberately Nerfed. How much more? In this case, ten times more (25¢ vs $2.50). And let's not even talk about the value difference between the aforementioned Serra and Baneslayer Angels.note Serra Angel has been printed with tons of different sets of cards, including the original Alpha set, often times as an uncommon, which you are guaranteed to get three of in every 15-card "booster pack" you buy. Baneslayer Angel is a Mythic Rare, which replaces the Rare in about one of every eight booster packs, and has been printed in only two sets. The Pokémon Trading Card Game similarly raises the bar for each generation. In the 1st generation, Stage 2 Pokémon (Pokémon who have evolved twice, like Charizard) were lucky to have 120 HP. In the 5th generation, Basic Pokémon (Pokémon who don't evolve or haven't evolved) get published with this much HP or more in every set, with evolved Pokémon approaching 200 HP. Attacks have since increased in damage and Energy costs too. It has gotten to where Base Set Venusaur's "Energy Trans," which allows free transfer of Energy between Pokémon, was a near Game-Breaker in the card game's earliest days but the later Meganium Prime from HeartGold/SoulSilver, which has the same power, was quickly brushed aside for quicker and more powerful cards. Inverted with Trainer Cards, which seem to get progressively worse as time goes on. In the original Base Set, you had a lot of draw power by using four copies each of Professor Oak, Bill, Computer Search, and Item Finder. Nowadays, cards with those effects are printed only as Supporter cards (you can only use them once per turn) or ACE SPEC cards (you can only have one in your deck), thus drastically limiting their potential. Yu-Gi-Oh! suffers heavily from Power Creep corresponding with the release of each new anime. The idea is that, to make the new game mechanics and wealth of new cards playable, they have to be stronger than what's already available. Most of the old cards that are still used tend to be "staples". This is sometimes subverted through the Forbidden & Limited List which attempts to balance the game out and can sometimes make older cards useful again. The addition of new ways to Special Summon monsters (specifically, Synchro and Xyz) represent a major form of Power Creep. In the old days of Yu-Gi-Oh!, certain Special Summons (Fusions and Ritual monsters) required their own cards for set-up(such as Polymerization, Fusion Material monsters, or the Ritual Magic Card), and generally could not be as easily deployed. The metagame tended to favor powerful single-Tribute monsters at highest (such as Summoned Skull). Nowadays, the right deck set-up can swarm the field with Special Summoned level 7 or 8 monsters. A common criticism of the game is that, unlike Pokémon and Magic the Gathering, Yu-Gi-Oh! lacks any "Standard" format - a format that would only allow players to use cards from the last "n" sets. This has caused a constantly-fluctuating and extensive banned list, as well as older cards completely breaking the new Summon types. The lack of 'standard' format is justified due to Konami periodically assessing the banlist, removing some older cards from it, since the meta game has changed. For example, in 2015, Raigeki (a spell with the effect to wipe out all opponent's monsters on the field without cost) was removed from the banned list, because most modern decks can handle getting hit by one due to easiness of special summoning in the meta-game than compared to the past. For example, Magical Scientist, which was long considered vastly inferior to Cyber-Stein (because MS only allowed you to summon level 1-6 Fusion monsters that died at the end of the turn and couldn't attack your opponent directly, while Stein allowed you to permanently summon ANY 1 Fusion monster), is now considered one of, if not THE, most broken creature in the game, because he can - by himself - summon-spam Fusion monster after Fusion monster, as his lifepoint cost is FAR lower than that of Cyber Stein.note Magical Scientist only asks for 1000 lifepoints, whereas Stein asks for 5000. This became a problem when combined with Catapult Turtle, who can launch the monsters at the opponent directly for damage (and there are enough Fusion Monsters with just enough ATK to kill the opponent before you ran out of life points) or overlay them to form an army of Xyz Monsters. Though he is squarely on the Banned list in Advanced Format, if a Standard Format were instituted, there wouldn't even need to be a Banned List that has him on it. A more positive example is Relinquished. When it came out in the third-ever set, it was pretty good, but it quickly fell off the radar - it was a Ritual Monster, which made it a bit too tricky to Summon to be worth it, and its effect (absorb an opponent's monster and gain its ATK and DEF) wasn't quite as amazing as it sounded. Then there came Preparation of Rites, which made drawing Relinquished and his Ritual Spell very easy... then Mystic Piper, which made it even easier... then Kinka-Byo, which let you repeatedly revive Relinquished and Mystic Piper... then Djinn Releaser of Rituals, which, if used to Summon Relinquished, let Relinquished negate all your opponent's Special Summons and could be used from the Graveyard. Even better, Relinquished's absorbing effect is surprisingly good in the current metagame, because it's technically not a destruction effect and therefore bypasses most traditional defenses. The result is that Relinquished, a card currently fourteen years old, can still perform well in niche decks. And then there is the "Traditional" format that is used in some unofficial tournaments, which does not operate under the banned list. The thing is entirely dominated by FTK decks and old ones have about just as much chance to win as new ones. You could say that this format perfectly determines how broken some cards actually are. The game's Power Creep is so infamous, these days, it's become somewhat of a poster boy for Power Creep in tabletop games. The most infamous example from the ARC-V era has to be Zoodiacs, an archetype designed to be so powerful that many Japanese card shops refused to have them legal in their tournaments out of protest . When Zoodiacs were released, the OCG metagame consisted of nothing else than Zoodiac decks and Zoodiac hybrid decks . This example has become so infamous that many are using as an example of how not to design an archetype for a cardgame, and why Power Creep in games can be a very, very bad thing. One of the (many) Dragon Ball Z trading card games saw this to an extreme degree with its very first expansion. The base set was overall pretty balanced - the more powerful characters had limitations, and sub-par combat cards in the set served as a balancing factor for specialized "style decks" due to the restricted card selection of those decks. Then the first expansion came out, and introduced characters with power levels several times those of the base sets cards, and combat cards that were flat-out better than previous cards with no trade-offs. The second expansion set introduced new versions of the basic characters with power levels so much higher as to make the original version worthless. And it went on from there. While this does follow the course of Dragon Ball Z's story (which is essentially Power Creep manifest), it represents a complete failure of Gameplay and Story Segregation. As new cards were introduced to Hearthstone, Power Creep inevitably followed. For example, when released Piloted Shredder was so much more powerful than any existing four mana minion that in most cases it became the only card worth playing at that cost. The following expansion had to include several cards designed specifically to counter it because the card had become so dominant. Extra Credits discusses this specific case in detail here. Players actually called this with two cards introduced in The Grand Tournament expansion: Evil Heckler is exactly the same as Booty Bay Bodyguard (A 5-Mana 5/4 minion with Taunt), but costs 1 Mana less, and Ice Rager marginally beats out the infamously bad Magma Rager in usefulness by the merit of having a single point of Health more than Magma Rager (as a 5/2, as opposed to a 5/1). This was acknowledged by Blizzard, and even parodied (see below). However, as pointed out by Extra Credits , Neither Magma Rager nor Booty Bay Bodyguard ever saw use except as throwaways by new players who didn't have anything better. Blizzard seems to be addressing the Power Creep issue with the introduction of Standard format, which forbids older expansions from being used. Coincidentally, the two expansions that are first being rotated out of the format (Curse of Naxxramas and Goblins vs. Gnomes) contains many of the most dominant cards in the game since. It also ensures that even new and possibly overpowered cards will eventually get cycled out, or at least possibly receive indirect nerfs by removing older cards that had strong synergy with newer ones. For example, Mysterious Challenger, the single-most notorious card at the moment, got less powerful with the removal of Avenge and Muster for Battle. note Avenge, when combined with Noble Sacrifice, allowed you to block a hit with a 2/1 minion, which would automatically trigger Avenge to give a random minion +3/+2. Combine that with Muster for Battle to summon 3 1/1s and Competitive Spirit and you can have either 3 2/2s and a 10/9 or a 7/7, a 5/4, and two 2/2s on the next turn, giving you substantial board control as long as the opponent didn't have Ao E removal at hand. Muster for Battle's comparative replacement, Stand Against Darkness, costs one too much mana to play in one turn normally. Parodied in Whispers of the Old Gods with Am'gam Rager. As the name implies, it's the aforementioned Magma Rager in reverse, and it's flavor text is "peerc rewop". The joke is that a 1/5 is for three mana is about as bad as a 5/1. A general issue with the Basic/Classic Sets is that they heavily overvalued effects like restoring health and Taunt while undervaluing effects like gaining attack and Charge. Later expansions have power creeped heavily to give effects their proper cost, to the complaints of almost no one... though a lot of players would enjoy the original cards being adjusted to match instead of simply being replaced. A commonly-touted example is Silverback Patriarch, a 3-cost 1/4 Beast with Taunt who even at the time was criminally understatted (basically paying 2 mana for 1 attack when compared to the 0/4 Shieldbearer). Since then, we've gotten: a 3-cost 1/4 with Charge and Taunt, a 3-cost 3/4 Beast with Taunt, a 3-cost 2/4 with Taunt, a 2-cost 1/4 with Taunt and "Give your C'Thun Taunt," a 3-cost 1/4 with Taunt that adds another Taunt minion to your hand, a 3-cost 1/5 Elemental with Taunt that has +2 Attack during your opponent's turn, a 3-cost 1/6 with Taunt that gains 1 health whenever you summon a minion, and a 2-cost 1/5 that's also a Beast. In Cardfight!! Vanguard, to see pure Power Creep in action, just look at how mechanics have progressed - at first, we had normal grade 3 units. Then, we got Limit Break and Break Rides, the former of which commonly added 5000 power to the vanguard, and the latter adding 10000. Legion kept the roughly-10000 power increase but eased up the activation conditions, as well as giving it to the vanguard for the entire time they are in Legion, not just the Break Ride turn. Now we have Striding, which adds 15000 power to the vanguard's attacking power, and it's fairly difficult to not be able to Stride at all. However the next mechanic works, it's a safe bet that it will add 20000 power to your vanguard. It's present on the other end of the scale as well; first, every card was either 5000 shield or 10000 shield. Slowly, more units came out that could go from 5000 to 10000 shield, as well as being passable units in their own right (if not amazing). The G-era gave most clans a card which was worth 15000 shield once a condition was met. Now, we get G-guardians, which are always the full 15000 shield, as well as adding all sorts of useful abilities (including gaining even more shield) on top. Perfect shields/null guards/complete shields have had their own style of creep. The base units were able to stop any attack by discarding a card. Newer versions only did it for your vanguard (i.e. the only unit that usually gets attacked with huge enough numbers to warrant a perfect shield anyway), but gave you a counterblast back if there was another copy of itself in the drop. Now, keyword perfect shields frequently lose the reflip ability, but give you some way to bounce back to the hand from the field, letting you use it as an actual unit without sacrificing the ability to defend from high-power attacks at all. Costs in general for abilities also lower over time. What once cost three counterblast now is free with new support , as well as adding 10000 power on top to make sure the front row gets pummelled... And even that wasn't even good enough to play, on release. Shadowverse has its fair share of Power Creep like any other card game, in not just general card quality improvements, but also with high-cost cards having exponentially stronger game-ending effects. Take a look at Fafnir from the original set: It's a sizeable 8/10 Dragoncraft follower for 9 Play Points and deals 2 damage to every other follower to clear out multiple small or dying followers. Now compare that to Bahamut , who costs 1 more Play Point, is a 9/9, is Neutral, and completely destroys every other follower, regardless of their defense. Now which of these would you include in your deck? Compare Maelstrom Dragon , a 2pp 2/1 which gains Storm if played during Overflow, with Dragoon Scyther , which only costs 1pp more, has 1 extra defense, gains Storm like her predecessor, but also packs Bane that lets her pick off enemy powerhouses. Naturally the latter is used much more. Spectral Wizard and Magic Owl both do the same thing — Spellboost cards in hand twice on evolution. Magic Owl, however, has entirely eclipsed Spectral Wizard, being 1pp cheaper and being 1 attack stronger after evolution, on top of being a Bronze card to add insult to injury. If you want to look at the most tragic case of power creep, then look no further than Skullfane . A 7-cost 4/4 follower is terrible on its own, but while its effect of destroying all amulets might sound good on paper, but it's impractical to have multiple worthwhile follower-summoning amulets to set up before playing Skullfane (not to mention the best you can get out of an amulet was a 6/6 follower back then), not to mention it also destroys any amulets without Countdown that aren't meant to be destroyed. Two expansions later, Eidolon of Madness is added to the game, which while it requires evolving for an instant effect, it does what Skullfane does but does it every end of turn as long as it's alive. When that wasn't good enough, two more expansions later, Heresy's Avatar gets added, which does the same thing but is permanent after it's destroyed, and it also affects only your Countdown amulets — the only ones worth destroying. Oh, and you can even combo it with Zodiac Demon to kill it off instantly. With that many layers of Power Creep, Skullfane has gone from a bad legendary to one of the worst cards in the game. The Power Creep seeped into design philosophy starting from the Rise of Bahamut card set, and came to a head in Tempest of the Gods and Wonderland Dreams, where the blatantly overpowered cards had a massive hand in creating the most dominant decks of their time which pushed out everything else. It was so bad that as of 2018, Cygames has nerfed at least twelve cards each from both the Tempest and Wonderland expansions to keep things in check, and even then some of the more dominant decks in the Rotation format hinged on cards from those expansions that have managed to avoid getting nerfed. Their design philosophy has shifted away from blatant Power Creep, but it will take time for the powerhouses of the past to leave the Rotation format to give their new ideas the breathing space to grow. ...Except even after those sets rotated out, Power Creep continues to run rampant, only in a different way. Cygames prints less cards that are bloated in raw value (usually ), but because of their philosophies shifting towards archetypes and their continued insistence on believing games should not last more than 10 turns on average, Power Creep is now geared more towards utility and making win conditions better. Post-Wonderland Shadowverse is extremely tailored towards specific archetypes and full of cards with permanent leader effects, and keywords like Choose, Accelerate, and Invocation create more cards that are less "dead draws" and decks easier to sift through. Cygames also has a habit of printing the perfect curve filler , combo piece , or just way to deal face damage effortlessly to underwhelming archetype one or half an expansion later and have it suddenly jump up a tier. Power Creep has also started to affect stats as well, with since Omen of the Ten the gold standard stats for 3-cost followers jumping up from 2/3 to 3/3 and way more cards with Evolve effects getting the full +2/+2. This happens a lot in each Civilization game with each expansion pack. As new mechanics are added, older civilizations may not be able to perform the same play style as effectively, while new civilizations may have unique units, buildings, and abilities that seriously outclass those from the vanilla game. In Civ V, America's unique ability, "Manifest Destiny", cuts the cost of buying tiles in half (and gives all land units +1 sight, a comparatively minor buff). Come the Brave New World expansion, you have the Shoshone's unique ability, "Great Expanse", which gives every newly-founded city eight free tiles and gives military units a combat bonus when fighting on friendly territory (i.e. on the home front). This thoroughly outclassed America's unique ability, which many fans felt should have been beefed up in Brave New World to make up for it. One of America's unique units, the Minuteman, did get a minor buff (it now generates Golden Age points from victories), but not enough to compensate. Also from V, the Aztecs did not get a rework in Brave New World. Before that, their unique ability, "Sacrificial Captives", giving them Culture for kills meant that they could be used to pursue a Cultural Victory (which involved accumulating culture points and using them to buy social policies), counterintuitive though it might seem. Under the Tourism system introduced by Brave New World, which heavily redesigned the Culture system, including Cultural Victories, that is no longer possible. The big one in V, though, is India. Their unique ability, "Population Growth", is the only one that carries a penalty: namely, it doubles unhappiness from the number of cities, with the fact that it halves unhappiness from total population (a very powerful buff) making up for it. It was crafted with the intention of building a very "tall" nation with a small handful of very densely-populated and built-up cities, which was optimal for a Cultural Victory in the vanilla game (more cities increases the culture cost of social policies). Brave New World, however, changed Cultural Victories such that a large empire is now preferable, precisely the sort of thing that India's unique ability pulls against. The result is that one of the best empires for a Culture Victory in the vanilla game and Gods & Kings becomes a Tier-Induced Scrappy in Brave New World. The fact that this trope was averted with Arabia and France in V, who both had their unique abilities completely redesigned for Brave New World to take advantage of the new systems in place (and in France's case, also got a new unique improvement to go with it), was especially stinging. Many fans felt that what was done with Arabia and France should've been a model for how to redesign other civs whose abilities were made redundant by new civs or changes to gameplay mechanics. Dungeon Fighter Online is pretty good on this matter but some of it still occurs mainly with higher caps making some of the lengthy quest for gear at a certain point useless to some new subclasses and class tweaks being quite strong but they don't remain that way for long. It's rumored that some of the recent tweaking (in regards to the game's raid content) in the Korean version threatens to invoke this on a massive scale. While not a multiplayer game, the Dynasty Warriors franchise exhibits this greatly, due to having so many successive entries, with each entry adding more and more new playable characters. Newly added characters usually have more powerful and/or flashier movesets, while older characters are left in the dust. This is painfully apparent in the 4th main installment of Samurai Warriors, where the returning characters are still using their old movesets from their first appearance, some as old as 10 years ago, while the new characters added in this entry have generally stronger and more effective movesets. Musou Stars is a crossover game that puts new and old characters together, including some of the older characters from the above mentioned Samurai Warriors. It attempts to rectify this by adding new moves to the older characters' movesets and injecting various enhancements, such as new attack animations, larger hitboxes, and smoother movement. Elsword is pretty bad about this in both releasing overpowered new content and the nerfing of things, often resulting in an uneven level of power. Like the League of Legends example, people suspect the new classes are overpowered to cause people to buy class change items to change them. All the while they're very slow to really bring up older classes/characters up to speed to the newer ones. Tellingly, despite being a Character Title game, players of Elsword -the first character on the roster- are vanishingly rare in the end-game. Final Fantasy XI is fairly good on this track since the release of the Abyssea expansion, first raising the maximum player level from 75 to 99 and then providing equipment that "simulates" player levels well above 100 by equipping it (in the later Adoulin expansion). While previous expansions did provide increases in equipment, those were mostly marginal or situational, but newer equipment has escalated on the improvements to such a degree that, for example, the legendary "Pandemonium Warden" boss (which gained some notoriety outside the community) can now be beaten by a single player, and there seems to be no end in sight, with nearly monthly updates that add new equipment (compared to the previous policy of roughly two updates a year that mostly fixed bugs or other issues). The developers have attempted (and at times succeeded) in keeping older content up-to-date by creating copies of it with higher statistics and level requirements and consequently level-appropriate rewards. The game's population has continued to decrease on many servers, but whether that is because of a case of "Broken Base" or despite the changes made by the developers is hard to say. Granblue Fantasy: Many characters have become less useful over time not because of their raw stats, but because they don't offer the variety that new characters often bring. However, there's a number of rebalance patches that attempt to bring older characters up to a more current standard, though some older characters' kits are just too flawed to improve much. Kingdom of Loathing has the "Item of the Month", purchasable in the cash shop (or with loads of in game money) which serve as the game's source of revenue. These items are usually the most powerful thing you could put in the 'slot' that it occupies, with several slots only being usable by these items. The items need to be worth purchasing for even old players, and so a small amount of this can certainly be seen as time goes on. However, a fair amount of the power creep owes to the very idea of what these items were allowed to do, as early items were just mildly buffed versions of existent items, or else just a bit more versatile or fun. Later items are much more powerful, in general, than early items because of a change in design philosophy to make these items much more unique, which usually translates in practice to more powerful. The developers are somewhat keen on averting this, however, although the limited availability of these items doesn't help matters. Some particularly popular old items have been 're-released' in different forms. In some cases, they provide the same 'important' option as before, but with some minor differences. New players can more easily obtain the useful item, and old players (who are generally obsessed with gaining every advantage they can) will find a way for the slight differences to give them a reason to use both. On the other hand, there have been instances where the new versions are almost complete upgrades, obviating the need for the old versions. Kingdom of Loathing, however, is for the most part a single player game. As such, it manages to avoid a lot of the problems generally caused by this trope. Players without a single Item of the Month can happily play the game, and still share quite a few strategies with those who own every single one, since the only real competition is indirect, and there's no need to worry about those who have been around longer and spent more money ruining the fun of those who aren't willing to spend money themselves. Many of the boss drops in the expanded Sea quest are unambiguously better than anything that came before them. The Stick-Knife is one of the most ridiculous: its +200% Spell Damage property is equivalent to the highest-end magic staffs, but the Knife is not a magic staff, comes with additional powerful add-ons that staffs don't have, and can, unlike staffs, be dual-wielded. The game also has the unusual problem of "adventure creep." Its Anti Poop-Socking mechanism limits the turns available per day, but there's no hard limit, and many items allow you to gain extra turns—rare or expensive ones tend to be more efficient. Some things directly increase the free chunk of turns you'll get the next day, or allow you to do certain things more times per day...as you'd expect, this leads to people spending more and more time on the game, and the developers aren't sure if this is a good thing or not. League of Legends is a Free To Play Multiplayer Online Battle Arena that updates frequently, usually accompanied with new characters. Accusations of Power Creep are frequent, and its developers have made it clear they are intent on avoiding it. Nerfs regularly happen in updates — to the point that some players accuse the developer of releasing characters Purposely Overpowered to cause players who like winning to buy them with Microtransactions, and then Nerf them in the next patch to placate their fanbase after raking in cash for a few weeks. That being said, numerous characters have been dubbed underpowered on release as well. While power creep has definitely set in over the years, Riot does seem to be making an effort to keep it from getting out of hand, which is best evidenced by their tendency to nerf strong champs rather than buff weak ones (as an overabundance of buffs tends to lead to the game turning into a trigger-happy crowd control and burst-fest). A particular example where the developers think they have failed to avoid the trope are many melee-range "fighter" characters being "overtuned". In a game where being melee-ranged potentially means up to five enemy players attacking you at once, while you can't hit more than one of them at a time in return, Riot have responded by making melee characters with sustained healing potential, movement-hampering crowd-control effects, high durability, good damage, and low cooldown Flash Step abilities to quickly place them next to targets (compared to movement-speed-increasing abilities that still force the user to run up to targets and are countered by slowing effects). The problem is, this puts the onus back on the ranged characters, who have little chance to avoid being gap-closed without the help of allies, or having a Flash Step of their own to dodge with. In other words, the only obvious drawback to this new breed of melee characters is they are not ranged, especially when earlier examples of fighters tended to have some clear lack of one of these aspects. A sentiment among some of the game's players similarly believe "gap-closer/gapcloser"s as a concept is overused by newer characters, numerous popular characters have them, and this has caused a "mobility creep" in new releases. To be fair, a lot more of the mobility options are conditional or otherwise involve some amount of risk, which is better than the targeted blink gap closers or click-and-escape abilities that used to be far more numerous. Car performance has been slowly escalating as the game has gone on, although with super cars the slowly part doesn't really apply. When the game was released, out of all the super cars released with the game, only the Adder is still technically the best in its given skill set and it's not by much. Cars like the Entity and Zentorno (which itself made several super cars obsolete when it was introduced) were surpassed by newer DLC cars like the Osiris and T20. After these cars came the X80 proto which functionally dethroned the Adder as the fastest car in the game while also having incredible acceleration and handling. After that came the cunning stunts cars, which had lower speed and or acceleration but even better handling than the X80. Cars' abilities also suffer from this. The basic cars the game had from the start are your typical get-you-from-point-A-to-point-B vehicles, but slowly cars were introduced that had mounted guns, bulletproof and later explosion-proof plating, and even homing rocket launchers. One notable example is with the Ruiner 2000, a car that has a jump-and-glide ability that gives you Video Game Flight. The following update had a DeLorean Expy that just straight up gave you the ability to fly. Better and better ways to make money have come out as the game has progressed. First grinding contact missions were the only real way to make the big bucks without resorting to Shark cards. Then heists were finally released giving the players access to huge payouts and shattering the standard set by contact missions. Then CEO work added to the game which boasted even greater money-making in the same amount of time at the cost of being much riskier due to both investment in product and by virtue of taking place in free roam lobbies. Then Motorcycle club businesses were released which don't offer quite the same money for total time but require a far less active role and don't require the player to risk investment in product. After that Import Exporting was introduced with an even safer and faster way to make money than the MC businesses. And after the July 2018 After Hours update, you have the nightclub, the first business that allows you to have a truly passive method of making money, needing only to do a mission every half hour to maintain nightclub popularity. There have been complaints that the co-op portion of Mass Effect 3 is feeling the effects of this, with accusations that each expansion's new weapons and character classes are deliberately overpowered compared to the vanilla ones in order to encourage spending more in-game credits/Microsoft Points on equipment packs. Pokémon stat spreads slowly became more specialized as time went on. Those that could be seen as Lightning Bruisers in Red and Blue became Jacks-Of-All-Stats as more Min-Maxing was done by the designers. In Pokémon X and Y, it reached its zenith with Mega Evolutions, which are explicitly designed to be on par with the series's Olympus Mons with less stat points to go around. The Ultra Beasts in Pokémon Sun and Moon are like the Mega Evolutions in certain ways too, with some extreme and specialized stat differences—Kartana, for instance, has one of the highest Attack in the game but its Special Defense is awfully poor. A similar situation also occurs with Abilities (passive effects that Pokémon possess). An ability that was introduced in Gen III, the generation that abilities as a concept was introduced, would provide something simple: For example, the ability Water Veil would prevent the Pokémon from receiving a burn. An ability that was introduced later might provide the same effect plus something extra: Water Bubble (an ability introduced in Gen VII) not only prevents burns, but also halves the damage received from fire attacks and double the power of water attacks (this effect isn't even mentioned in its in-game description). Pokémon Omega Ruby and Alpha Sapphire brought along two Mega Evolution-like Legendaries in the form of Primal Groudon and Primal Kyogre, except neither use the party's Mega slot — essentially allowing three in a single party. Its new Mega legendary, Mega Rayquaza, requires no item for its Mega Evolution to occur (it just needs to know a specific powerful attack), possesses an Ability that removes its Flying type weaknesses and other Weather conditions, has a base Attack of 180, and tied with Mega Mewtwo X/Y's 780 base stat total. It has the infamous distinction of causing a new Smogon tier called "Anything Goes" to be created, a ban list for the Uber tier which itself was meant to be a ban list. Pokémon is also a subversion in that many monsters from early versions of the game also frequently get new moves, abilities, evolutions and other changes to mechanics that make them much more playable. One such change was dividing all attacks into being physical or special, rather than one or the other based on its type. This allowed many Pokemon to make better use of their attacking stats. * For example, the Kingler line has high Attack power, but since Water-type attacks were originally special in nature (thus running off its lower Special Attack), Kingler's Secret Art Crabhammer wasn't very useful. In newer games, Crabhammer is considered a physical attack and runs off Kingler's Attack stat, allowing it to do a lot more damage. The above-mentioned Mega Evolution mechanic was mostly given to older Pokémon. To give an idea of how egregious this can get, Pokémon Diamond and Pearl introduced Arceus, the creator of the Pokémon universe with 120 in all stats, a wide movepool, and the ability to be any type. Since then, while it's still a potent powerhouse, there are quite a few Pokémon like Mega Rayquaza and Ultra Necrozma who eclipse it in raw power. Hits the later MechWarrior games. In MechWarrior 4: Mercenaries, the mechs added by MekTek when the game became Freeware are often blatantly better in many roles than the vanilla mechs. In Living Legends, the later added mechs are better overall than the older mechs due to superior chassis characteristics and often better variants - though the older mechs were buffed to competitiveness in the final update. Power Creep will be a game mechanic in Online, which takes place right at the time when Lost Technology is being rediscovered, and when the Clans invade with their superior technology - the old mechs with 3025 tech will be curb-stomped by the later 3049 or 3050 series of mechs. Team Fortress 2 almost always subverts this; virtually all unlockable weapons have downsides (the few exceptions are gimmick melee weapons). Anything that's considered a must-have tends to be a utility item that doesn't replace your primary weapon, such as the Heavy's Sandvich (replacement for shotgun) which they use to heal their Medics, the Sniper's Jarate (replacement for SMG) which gives the character a team player tactic, and the Red-Tape Recorder (replacement for the Sapper) which makes the Spy an absolute nuisance to the Engineers. In Mario & Luigi: Superstar Saga, the weakest enemy has 4 HP, the first big boss has either 30 or 50 HP depending on which one you count, and the final boss has 1200 HP. In Mario & Luigi: Dream Team, the weakest enemy has 8 HP, the first boss has between 96 and 288 HP depending on which you count, and the final boss has 2417 HP. Bros Attacks, Badge effects and gear have also got progressively more powerful as the series has progressed. Averted with Battle Ring/Gauntlet bosses (the ones in Bowser's Inside Story are stronger) and Partners in Time's later bosses (which are harder than those in the last two games). This is easy to spot in Paper Mario, with the first game's weakest 'real' boss having 10 HP, Thousand-Year Door's having either 12 or 20 HP, Super Paper Mario's having 20 or more HP and Sticker Star's having 90 HP. The final bosses also have 99 HP, 150 HP, 200 HP and 500 HP respectively. The power of most attacks also went up in each game. Though all of these are cases of Power Seep when compared to the forerunner to both of those series, Super Mario RPG had numbers similar to other RPGs of the time and even now: the player's HP caps at 999, enemies can have upwards of four digits, and the strongest attack does 9999 damage. MapleStory takes this trope and runs with it. Due to the age and lifespan of the game and the nature of it being a constantly-evolving MMORPG, this is bound to happen. Characters that are added later down the line have abilities that are astronomical compared to characters present during the game's launch. To their credit, Wizet often overhauls the older classes with new skills and animations to the point where they are still exceptionally viable alongside the newcomers. While the newer classes tend to be more visually impressive, the older classes can easily keep up damage-wise. This has been a problem with Star Trek Online concerning PVP as the game keeps tossing more and more starships with stronger weapons and abilities. The worst of the bunch is the Romulan Scimitar warbird. Outfitted the right way, you could essentially one-man an Elite PVE match and dominate PVP. In the same vein, people use this as to dump the Galaxy-class and Galaxy-X-class ships as this as they focus more on tanking than actual DPS, leading to them thinking of it as "useless". Star Trek Online has had this problem since the arrival of the Romulans in the first expansion Legacy of Romulus. Romulan Bridge Officers have the ability "Subterfuge", with makes them fearsome when coming out of cloaking as they get a hefty damage bonus doing so. Getting an entire set of Bridge Officers with the better "Superior Subterfuge" means you can wreck things immediately coming out of cloak. It gets worse as many players will tell you that, if you want to get the best effect, have your Romulan character choose to side with the Klingon Defense Force as they'll tell you that their Vandal Destroyer (which includes the power level-booster Plasmonic Leech) and the Romulans' Valdore-class (which include the shield regenerating Shield Absorptive Frequency Generator) makes you a fearsome foe. The Tier 6 ships introduced in the second expansion Delta Rising has seen calls of this, especially towards older ships as they include an extra console slot, an extra Bridge Officer power slot, involve new powers and include abilities that make you even stronger. Before Update 13, heavy weapons ruled the melee world thanks to their powerful charge attacks. When Melee 2.0 removed charge attacks, heavy weapons didn't get anything in return, leading them to get outclassed by faster weapons which could be more easily used as mobility tools. Surprisingly, they did get a significant damage boost much later, allowing them to become relevant once again. The Boltor Prime is the most blatant example for primary weapons. Compared to their non-Prime counterparts, most Prime weapons have damage bonus between about 20% and about 40%. The Boltor Prime has a 120% bonus over the Boltor. And unlike most guns its accuracy doesn't suffer much from the damage-boosting Heavy Caliber mod. It's widely considered to be the "default" endgame rifle, to the point where many players dislike it because of how often it gets used. DE seems to have learned their lesson here, since while many primaries since have been on par with it, nothing has outright been able to outclass it. Newer Warframes tend to have more cohesive kits (compare Mirage to Saryn), but the real example is Prime Warframes. Initially, they were fancy reskins with different default polarities and a special interaction with the Death Orbs in the Void. That lasted until the fifth one, Rhino Prime, was released. In an unprecedented move, Rhino Prime had a statistical advantage over his base counterpart: his movement speed had been increased from 0.9 to 1.0. While the change wasn't game-breaking (without an Arcane Vanguard helmet, at least), the damage had been done. The very next Prime, Loki Prime, featured a significant boost to his energy pool, making it the highest in the game at the time. Then Nyx Prime came with two stat boosts, both modest and not especially helpful for her; this didn't stop Nova Prime from getting two significant stat boosts, one of which covered one of her weaknesses and the other of which tied her with Loki Prime for highest energy pool in the game. The real sign that things had gotten out of hand was when Volt Prime not only sextupled his armor, but also doubled his energy pool, putting him above even Loki Prime and Nova Prime. As of Update 16.11, we now have Ash Prime with three moderate stat boosts. Excalibur Prime, Ember Prime, and Frost Prime were later updated to have minor armor or shield buffs over their base variants, but they're still nowhere close to the improvements of later Prime Warframes. Damage 2.0's scaling worked just fine when it was announced and still plays nicely until you get to enemies about level 50. Once you cross that threshold, however, enemies start to become lightning bruisers at all times. The Grineer in particular become nightmarish for being Nigh Invulnerable if you don't have a way to strip their armor from them. Played straight between the first two Fallout games, where all the weapons in the original title were reused for the sequel. The presence of the heavily armored Enclave soldiers meant that classic heavy weapons like the Rocket Launcher, Flamer and Minigun were superseded by the accurate, devastatingly powerful Bozar as a reliable endgame loadout. Energy weapons received a similar treatment, with the rare Pulse Rifle receiving a special 80% Damage Threshold reduction perk that former standbys such as the Laser and Plasma Rifles lacked. World of Warcraft used to have a problem with this with different gear of the same level. The level progression is almost endless — from one to 110 with the sixth Expansion Pack — so obviously old enemies and gear are going to become weak compared to the new. The problem, however, was that the new starting gear from an expansion would be more powerful than the max-level gear from the previous one. Most commonly used are three tiers of gear, Uncommon, Rare, and Epic, in order of increasing power. Starting from the first expansion, people used to say that mere Uncommon gear from the expansion was as powerful as Epics from the original game. This wasn't really true, but the new Uncommon was roughly the same as the old Rare; this gave more incentive to go into the new content, but it also removed incentive to eg. go through the trouble to craft some old Rare items or do some old quests. The same happened between the first and second expansion, and by the third one, it became true that the new Uncommons were as good as the previous Epics. After that, though, they revised all the power levels of everything in the game so that there was no longer any such gap with either the new expansions nor even the old ones. You still don't need to go to old raids to get powerful enough stuff to move into the next expansion, but if you've done it, you'll be overgeared at the start of the expansion. One particular example did not happen yet, but would come to life at the start of the seventh Expansion Pack, Battle for Azeroth. The current one gives players Artifacts, a whole set of different powerful weapons both in game and in story. The minute Battle for Azeroth is released, they are going to become no more then a waypoint between level one and the up-to-date content. This happened with Trinkets. During Classic, Trinkets were an extra equipment slot that held a variety of purposes. Some were little toys that did things like put a disguise on the player. Others did things like toss a boomerang that dealt damage or summoned a cannon that fired on nearby enemies. Others removed debuffs. Others were functionally useless but boosted stats. Others gave a temporary buff to the player. And some did a combination. Naturally, the stat-boosting and buff-granting (Especially if it was a combination of both) were the much more popular ones amongst the players, because why bother wasting time summoning a ghostly ally to fight alongside you for a couple seconds when you could just be attacking? And why bother carrying around that neat little toy that makes everyone around you dance if you can have something that makes you deal more damage? As a result of this, most trinkets at max level just temporarily buff the player and give stats, since players would much rather use a Stat Stick that's lower level than a max level trinket that just tosses a bomb at the enemy. You get this in World of Tanks due to older tanks not being adjusted to new tank stats. For instance, the Super Pershing is a premium Tier 8 medium tank that used to be a decent choice in older builds of the game, trading agility and firepower for amazing frontal defenses. However, with the advent of fast, accurate tanks such as the Panther 58 Mutz and Patton Korea, as well as larger guns with ever-increasing penetration values, the Super Pershing is now considered one of the least favorable, least profitable of the Tier 8 premiums. This also happened to the KV-1 with the introduction of the O-I Experimental, a tank in the same league of armor and firepower but was a good 33% faster even though it was almost twice as heavy. To Wargaming's credit, they did try to buff the Super Pershing back to being a defensive powerhouse and nerfed the O-I series of tanks to make them less ridiculously potent, so they are at least aware enough of the trope to try and head it off. The The Elder Scrolls III: Morrowind has this happen in the expansion packs. For example, the natural enemies you encounter in Bloodmoon (such as wolves and bears) are as powerful as enemies you find inside the Ghost Fence in Vvardenfell, home of the 4000 year-old Physical God Big Bad. The expansion also contains some of the few weapons in the entire series which are stronger than Daedric. Terraria has gone through several infrequent but major content updates, expanding the number and variety of items available to the player at almost every stage of progression. Unfortunately, in many cases the newly-introduced items are invariably superior to their contemporaries, though the degree to which this happens varies. For instance, one update introduced Tin, Lead, Tungsten, and Platinum, ores which are functionally identical to the game's original Copper, Iron, Silver, and Gold ores - any recipe that calls for one will have an identical recipe that calls for the other, and produces the same result, such as a Gold Watch versus a Platinum Watch, which both do the same thing. In fact, a newly created world would randomly pick just one ore of each tier to generate with. Hardmode introduces another set of ores which have similar alternate mirrors that the game will randomly pick from. However, weapons and armor made of the alternate set of ores are strictly superior to the original ores. Besides that, there's also a number of items which behave quite different from their old, in-tier cousins, but are nonetheless vastly superior. For instance, among Melee weapons, good early game weapons included Flails which could hit lots of enemies but were difficult to use, and Spears which were great for playing keep-away but had much less range than Flails. The Ice Blade was introduced later, and can be found randomly in chests at the very beginning of the game if you're brave/skilled enough to explore. Between its projectiles fired on swing, good DPS, autoswing, and ease of acquisition, the Ice Blade managed to completely blow every other pre-Hardmode melee weapon out of the water except, arguably, for the Infinity +1 Sword that requires a complicated crafting process to obtain and another sword that has a low chance of appearing in one of a handful of shrines that generate in a world. And then Patch 1.3 came along and introduced Yoyos, with a behavior set and damage output that rendered every other melee weapon in the game almost completely obsolete, starting with the fact that they can effectively stunlock foes without effort and attack enemies around corners and through one-block-wide gaps with impunity. The power creep in Terraria can be best exemplified through what was once the game's true Infinity +1 Sword; the Terra Blade . Creating through an extremely long crafting sequence spanning the entire game , the Terra Blade had extremely high DPS, a projectile attack and didn't cost any mana for it. An extremely useful weapon and very powerful at the time it was introduced... Then the Influx Waver was introduced. Higher base power, a projectile attack that hits enemies twice and it has around the same swing speed as the Terra Blade, without the need to go through the Chain of Deals to get it. All it takes is farming a boss from an event to get it... An event that opens up around the same time one would be able to craft the Terra Blade, effectively rending the Terra Blade useless! Expansions for The Binding of Isaac have a tendency to introduce items that are objectively superior versions of items already in the game. One example would be the case of flying - in the original game, getting the ability to fly was a rare ability only handed out by three items - Lord of the Pit, Transcendence, and the Pony. Of those three items, Lord of the Pit costs two red heart containers to obtain, Transcendence is one of the rarest items in the game, and the Pony takes up the active inventory slot that could be used to hold an item with a more helpful active effect. However, Wrath of the Lamb introduced four flying items that were either easier to obtain or came with additional benefits. By Rebirth onwards, it was rarer for a run not to stumble upon at least one permanent flying item, making the initial flying items seem redundant. Fire Emblem Heroes has slowly developed this problem over time. Characters who were in the game at launch or released in early banners are generally outclassed by counterparts released later, due to newer characters having better stat spreads and more useful default skills and weapons. The devs occasionally update the weapons of old units to help bring them more in line with the current power curve, and the ability to give one character the skills or weapon of another can also help close the gap, but for some units even this can't make up for their weak stats. For a good example, compare Fragile Speedster infantry sword units who were available early on with some released later. Lon'qu had 39 Speed, the highest in the game at launch, in exchange for middling to poor stats in other key areas. While he remained the fastest even as other infantry sword units came out that eclipsed him in actual combat ability, eventually Mia was released, a unit who not only had higher Speed at 40, but beat him in literally every stat except HP, and came with a powerful unique weapon and useful skills to boot. And even she was outdone by the arrival of Karla, who also had 40 Spd, but higher Attack and an even more powerful weapon. While Lon'qu eventually received a useful unique weapon of his own (enough to put him on Mia's level, in fact), he's still roundly outclassed by Karla. Bejeweled Blitz was hit pretty hard with this over the time of its existence. At the beginning, it was a simple match-three game with 1 minute to get a score. At that time getting over 500k was considered a feat. Then the coin system was added, and a boosts, which could be bought with those coins for three games each. This helped to get higher scores, but getting 1M was still almost impossible. Then they added gems, which are the straightest example of this trope - the first gem merely added three star gems at the beginning or a special score bonus, but now they have effect that essentially nukes the entire board for high score bonus, culminating with 'Blue Thunder' gem that allowed to score over 50 million with the boosts. Then the boosts became free, got stronger effect right from the beginning and each can be upgraded to level 11, with stronger effects. And finally it was sealed by adding new boosts, the latest of which, Quickfire, activates a Blazing Speed, making each match explode while giving ridicculous bonuses that you can score 50 million without the gem - which got stronger since the 'Blue Thunder' as well, meaning you can get over 300 million now.